With the average cost of living going up and up across the country, performing an electricity price comparison in South East Queensland, Brisbane, or the Gold Coast in order to find a better energy supplier is a smarter, long-term way to reduce your costs. The good news is that the Brisbane and South East Queensland area is one of the easiest markets to get an electricity rate comparison. With the energy market becoming deregulated in July 2016, this opened the gates for new energy companies to enter the market, and increased the competition on offer for consumers like yourself. But with so many energy suppliers in the region, the question is: Who actually offers the best deal on electricity? Electricity Wizard can help you compare these providers and get a better deal. To start with, let’s get straight down to the nuts and bolts of how you can compare different energy suppliers in Brisbane. If you don’t have time to sort through all the details, then save time and call Electricity Wizard so we can switch you over to the cheapest electricity in Queensland. When comparing energy companies, it helps to have an understanding of what costs and fees go into your electricity bill as well as the range of different plans that each company might offer. While it might seem like some numbers and graphs thrown into a page (with a high price to boot), understanding your electricity bill isn’t as hard as it looks. Part 1: Supply charge priced in cents per day — the cost to have electricity supplied. Part 2: Usage rates charged in cents per kilowatt hour — how much electricity you actually use. Part 3: Demand charges in dollars per kilowatt per month — depending on the maximum demand during that monthly period. The supply charge is the fee you pay to be connected to the grid. This fee will normally stay around the same every bill. Your supply charge may also include an extra fee for metering services. This “service to property” fee is charged in cents per day. Keep in mind too that if you see a plan that has a surprisingly low supply charge, this will generally be offset by a higher usage fee. The usage charge is a fee your retailer charges you for the amount of electricity you use. It is charged in cents per kilowatt hour based on consumption (you many see it abbreviated on your bill as c/kWh). Your electricity usage rate will vary according to the type of tariff you are on, but is generally made up of peak and off-peak usage charges. The demand charge was previously restricted to businesses or larger energy users, but now applies to some households. It is based on the amount of electricity a customer takes from the network over a particular time period (often 30 minutes). In Queensland, tariffs are regulated by the Queensland Competition Authority. While electricity companies may use different names for their rates, they must all meet particular standard Tariff rate structures. What is a Single Rate Tariff? A single rate or flat rate tariff (Tariff 11) means you’ll have one set rate for your usage, no matter the time of day or night you’re using your electricity. In other states, a flat rate tariff might be higher than other tariffs and are becoming less common with the introduction of smart meters. For users in regional Queensland, Tariff 11 is the Standard Residential Tariff and is often lower than timed-used rates. What are Time of Use Tariffs? A time-of-use tariff (Tariff 12A) means you’ll get charged different rates depending on the time of day you use you electricity. This usually means higher rates during peak times (the afternoon and evening), slightly lower rates during the shoulder period (early morning), and then lower rates during off-peak times (generally overnight). A similar tariff offered by some companies is the Flexible Pricing Tariff. During Summer, peak rates might also apply to daytime use when many people are running air-conditioners. What are Seasonal Time of Use Tariffs? Also known as Tariff 14, Seasonal Time-of-Use Tariffs add in an extra demand charge during peak summer periods, but are off-set by lower daily supply charges. What is a Controlled Load Tariff? Controlled load tariffs (Tariffs 31 and 33) apply to single appliances that generally have their own electricity meter. Things like electric hot water systems, underfloor heating, and your pool pump are likely to be on a controlled load tariff. If controlled load tariffs are available, they will often be significantly lower than other usage rates as long as you use them outside of peak hours. You can have more than one appliance on its own controlled load tariff. What is a Standing Offer? The default pricing structure published by energy retailers is usually their highest priced plan. If you were automatically allocated to an electricity company when Southeast Queensland was deregulated, you would have been placed on a standing offer. Default Standing Offers vary greatly across the different electricity networks and between electricity companies. A huge 26% of customers in Queensland are still on their default standing offer and have not taken the time to switch to a better market deal. These customers would be paying the highest rates and are likely to be wasting hundreds of dollars every year. 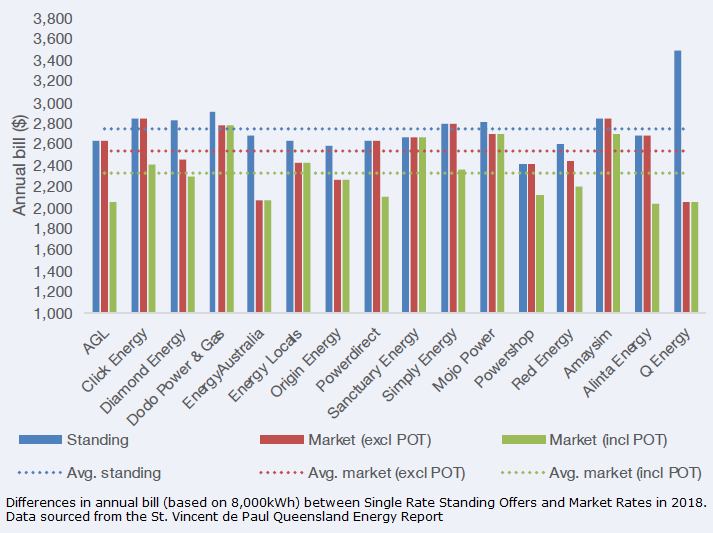 The 2018 Tariff Tracking project found that a typical household in Southeast Queensland using an average of 8,000kWh of electricity per annum would save around $425 a year (depending on their network area) if they switched from the default retailer’s standing offer to their market offer. Once you’ve understood just what goes into your bill, it’s helpful to have a look over it to see your current energy usage, and your rates. Look over your recent bills to see the rate you’ve been charged, and your daily energy supply charge. How does it look? Make note of any trends, such as an increase in use, or if it’s remained steady. Knowing this can help you work out the type of plan that will suit you best. It also helps to understand the current electricity costs in Brisbane. Something to be aware of is that all electricity providers in QLD are charged the same fee from their distributor. This distribution fee is regulated by the government. But the price that individual retail suppliers charge the end user can vary a lot! So to compare deals accurately, you don’t have to worry about different network supply rates. All you need to do is find the supplier in Brisbane with the highest discount percentage off your energy bills. While discounted plans and special offers change all the time, the 2018 Tariff Tracking Report found that for customers getting the pay-on-time bonus, the difference between the best and the worst market offer was between around $750. That’s a huge reduction in your bill just for shopping around! Check to see if any discounts currently apply to your bill. You can usually find this on the front of the bill or on the back, next to your rates. How much are you saving? 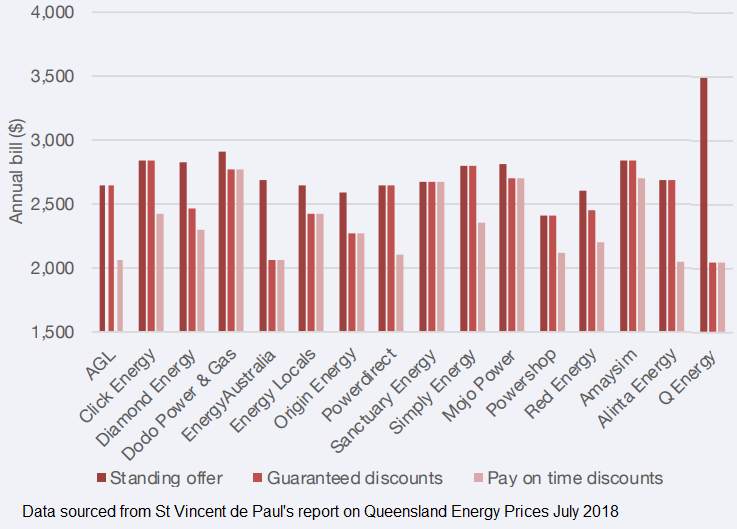 Most Queensland electricity companies that operate in Brisbane and the Gold Coast only offer discounts off c/kWh rates, NOT your supply charge. This is one area where customers need to make sure they know what they’re comparing when trying to weigh up different plans from different companies. Always ask if they take the discount off the usage rates or off the total bill. This is where you can start to save more. When shopping around, ask your supplier what discounts they offer. You’ll be able to find discounts on things like setting up direct debit billing, switching to paperless correspondence, and even just paying on time. As well as discounts, always ask if your prospective supplier is able to match, or beat, the rates set by their competitors. In a deregulated market, competition is high and suppliers are keen to get you as their customer. This lets you find a supplier that you like, and get a rate that helps you save. It’s quite a list! But the beauty of this is that with so many supplier options there’s certain to be a company that you’ll want to go with. Ask around to see which companies share your values, such as getting their energy from a green energy source, or being locally-owned and operated. To make sure you’re always getting the best deal, it’s recommended that you compare energy suppliers every 12 to 24 months, to ensure you’re taking advantage of the best rates available, and any new technologies that may have come along in the meantime. If this all seems like a lot of information to take in, then don’t worry—you’re not alone. We’re here to help. Electricity Wizard can provide you with a fast and accurate electricity price comparison, so you can start saving money on your bill today. Compare apples with apples. Not every plan is the same, so we’ll make sure you’re comparing like for like, and actually getting a better rate. Ensure the supplier payment method suits you. With the amount of options you have to with which to pay these days, it would be silly to go with a supplier that didn’t offer your preferred method. Protect you from “unexpected” rate rises. We’ll do the digging to ensure you’re fully aware of any catches in the fine print. Protect you from a contract with massive termination penalties. Get you the “solar buyback” that you deserve. As Queensland is one the States with the highest proportion of houses using solar power, it makes sense that if you’ve got it, you want it to work in your favour. Provide you with useful tips and tricks on how to save energy and reduce your power bill even further. So call Electricity Wizard today. We’ll help you compare electricity companies to see which retailers offer the best discounts, such as off your total bill (however, this is subject to change at any time). If you would like to find out which companies offer a total bill discount, call Electricity Wizard so that one of the staff can assist you. Electricity Wizard is based 100% in Australia and will get you the latest, most up-to-date comparison for which of our preferred electricity suppliers are best suited to meet your needs. To compare your home or business electricity rates, undertake a complete electricity comparison in Queensland or Brisbane, or even get tips on how to save energy and reduce your utility costs, call Electricity Wizard on 1300 359 779 today!